← Who Really Wins from Globalization? The heat is on. The first round of the 2014 Brazilian presidential election is now under two weeks away, and the polls are tight. With the field whittled down to a two-woman fight, I’ll give you my latest impressions from the campaign trail. Marina probably beats Dilma in terms of likability and affect (the old “who would you rather have a beer with” motif). The incumbent often comes across as stubborn, confrontational and just not much fun to be around with. In a recent TV interview for example, she spent more time arguing with the journalists about her right to lengthy answers than answering questions about her program. She even (accidentally) flipped the audience the middle finger. The central point in the video is that Dilma is lying when she alleges that her rival is planning to abolish the popular Bolsa Familia program which gives income support to poor mothers with children. How could someone who has lived through the sort of hunger and deprivation as Marina Silva, a rubber-tappers daughter, cut Bolsa Familia, a crucial lifeline for the poor? 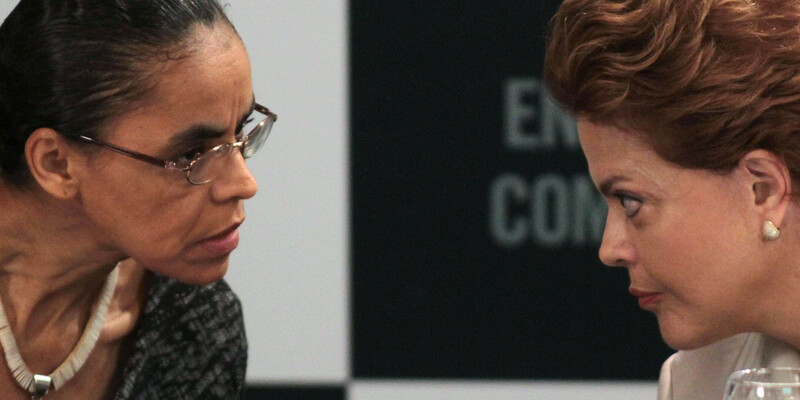 The bigger point is that the Dilma campaign is engaged in a character assassination and scare campaigns aimed at shooting down Marina who had risen above the incumbent in the August polls. Apart from the official allegations that Marina, who favors independence of the central bank, would take poor people’s food of the table to increase bankers’ profits, there are also all kinds of wacky conspiracy theories floating around. My favorite so far is the idea that Marina, an environmentalist, is a US agent, part of an imperialist plan to destabilize Brazil. Some even allege that the crash of Eduardo Campos’ plain was fabricated by the CIA. Public opinion on Marina is becoming increasingly polarized. Some see her a a new model of leadership (Foreign Policy Magazine, we’re looking at you here). The PT and other leftist propaganda display her as a puppet of financial capital. They claim she is unprepared to manage the government, and they compare her to the spectacular failures of past outsider candidates (Quadros, Collor, now we are looking at you). The PT campaign, along with Marina’s own mistakes, are having some effect: Marina’s rejection rate (people saying they will never vote for her) doubled in a month’s time, from 11 percent in August to 22 percent in mid-September. At the same time Marina’s lead over Dilma in the polls for a potential second round has eroded to two percentage points, from ten at the end of August. It is in many ways an uneven fight. The Dilma campaign draws on the strongest party machinery in Brazil, the power of incumbency and half of the total TV time allotted to presidential candidates (Dilma’s total TV advertising allotment is over 11 minutes). Marina is supported only by one smallish and a couple of microscopic parties. Her TV time is only 2 minutes. Marina, however, is comfortable in this role of outsider and underdog, and she frequently comparing it to a struggle of David and Goliath, or even a mosquito and a bumblebee (even suggesting Dilma looks like a bumblebee). Dilma’s response to being called a bumblebee. On the other hand the Marina campaign is strong outside the traditional arena of politics. With her base of urban, young, better educated voters as well as evangelicals, she has a very strong presence on social media. Brazilians have become avid consumers of social technology. Today, nearly half of all adult Brazilians are on Facebook or other networks. This includes a large part of lower middle class swing voters who are likely to decide the election. This entry was posted in Uncategorized and tagged Brazil 2014 elections, Dilma Rouseff, Latin America blog, Marina Silva. Bookmark the permalink.